The new LinkedIn company page platform is a huge improvement over the previous incarnation, which placed a wall around your company’s information. It also had limited functionality, and very few opportunities to link back to your corporate website. With this new platform, you now have the option to create custom product views of your offerings for differing audiences, based on where they are located, what their job title is, or which industry they belong to (among other features). This new platform allows you to develop your LinkedIn profile as a logical extension of your corporate website. It also provides fairly comprehensive in-bound linking opportunities back to your pages that provide information about products, services, contacts and job opportunities. To summarize, at a high-level the new LinkedIn platform provides the company with the following expanded functionality. Previously, the focus was on basic company information. The new platform shifts focus from the company, to products and services. Products and services can tailored to any audience based upon profile information. Products and services can be supported by advertisements and video. Recommendations and followers are integrated into the product and service experience. A new set of analytical tools are available to track key performance metrics. The new functionality includes a nice graphic slideshow (Spotlight) to highlight products and services. You can also feature individual products in a series of self-contained text boxes with links back to custom landing pages. There is also a share button to allow viral distribution of your content. Another powerful function is the Recommendations feature, which allows people in (or out of) your company’s network to recommend your products and services to first-time visitors. The new platform also provides an Analytics section to monitor traffic and other viral activity. I will discuss these product features and others in a little more detail later in this post. If you are looking to see how firms are using the new functionality, check out the following sites. These are good examples of how this new functionality is being used. The new LinkedIn Company pages are integrated using tabs. The first three tabs are visible to your visitors; however the Careers tab is optional. The fourth tab, Analytics, can only be seen by the your administrator. The default view to your visitors is the Overview tab, but you do have the option to default to Products, if you choose. The following three lists detail the functional modules available in each tab. I will leave the discussion about the Careers tab for the end of this document since it does not provide much support for positioning your products. However, the Careers section is fairly robust and provides a number of excellent in-bound linking opportunities for your company. Display Banner: With a company logo, and an expandable description. Follow and Share: With a count of followers, and a Follow Company and Share button. Also has How Connected information. Your Network: With New Hires and Employees sub-tabs. Recent LinkedIn Activity: About company employees. News Module: Company mentions from main-stream news publishers. Company Snapshot: Type, Size, Industry, URL and when founded. NASDAQ Module: Interactive, choose from 1 day to 1 year view. Recent Tweets and Blogs: Blogs module RSS driven. Polls Module: Controlled by you (optional) or by any other company. Ads Modules: From LinkedIn members or from any other company. Display Banner: With a company logo, title and description. Spotlight Module: Featuring a 3 slide rich-media show with links. Follow and Share: With a count of followers, and a Follow Company and Share button. Recommendations Module: Displays your network of recommenders. Featured Products Module: Has an image, out-bound links, descriptions and product category. Products Listings Module: Can associate an employee with a product, with links to an expanded landing page. Product Snapshot: The number of products and recommendations being displayed. Product Video Module: Provides support for product listings. Promotions and Offers Module: Features a text-based 3 slide presentation for special offers. LinkedIn Groups Ads Module: Promote or join a group. 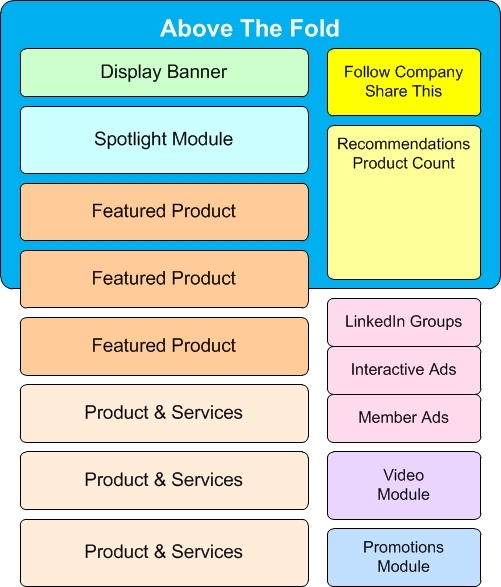 Ads Modules: By LinkedIn members. Interactive Ads Module: From you, or any other company. From a first impression perspective, you should focus upon the features that are above the fold. This means that the Display Banner, the Spotlight and the first Featured Product should be well thought out, and should hang together as a well-integrated message. The second part of this first impression is to have critical mass in Recommendations and Followers, so that your potential partners can see that you have a lot of enthusiastic customers. Since Ads, Video, Promotions and Products & Services are below the fold, they can play a supporting, but important role as the second impression. One of the more important features now implemented, is that you can develop multiple versions of your LinkedIn page to target different audiences. Target companies by size: ranging from 1 to 10K employees (9 increments). Target individuals by job function: 18 job categories. Target by a single or multiple industries: 17 industries with hundreds of sub-groups. Target individuals by seniority on the job: 7 levels of experience. Target individuals by location: by continents. With the ability to target individuals by industry, you will have the option to create custom product views that are tailored for the various industries that you support. Further, you have the option to segment each industry by job title. For example, you could have a different presentation for CEO’s vs. the VP of Marketing, or you could target lower-level employees who are probably doing research for their boss. Finally, you can also develop a customized video for each of these audiences. So, let’s take a look at each feature in the Products section to see what function it serves. The display banner is available in both the Overview and Products tabs, but they are somewhat different – in the Product section the display banner has a title, which is not available in the display banner in the Overview section. You also have the option to display your company logo, or not. In the Recommendations Module you can see how many products and services are listed, and how many recommendations have been made for your products and services. In the bottom section, you see the people in your network who have recommended your company’s products. If you hover the cursor over the individual’s name, a call out will be displayed providing some profile information about that individual. These product Recommendations will also appear in each of these individual’s profile, which provides even more exposure. The two major pieces of functionality in this module allow an individual to follow a company, and to share information about your company with their network. The Spotlight Module features a graphical three-slide slideshow that can link back to any page in your corporate website. This functionality is very slick, and will be perfect for repurposing graphics you may have used on your website. The graphics must be 640 x 220 pixels in size. You can have multiple featured products listed. Potential customers can hover over the recommendation photos to see profile information. They can recommend this product themselves, or share this product information with their community. When a visitor clicks on the title, it will take them to an expanded product page (within LinkedIn) that provides more information about your products and services. The expanded featured product page provides you with the option to display as much product-related information as you wish. Each expanded listing is also supported by a promotions text block that allows you to pitch potential to customers, and drives them to a custom page at your website. The title is the link. At the bottom of this section (beneath the bullet list) is a list of all LinkedIn members who have recommended this product. When you’re in edit mode there is a Request Recommendations button you can use to solicit recommendations. The product listings are identical to the featured product listings; they simply are displayed further down the page. You will have the option to filter and sort these listings by recommendations. You can have as many product listings as you like. You can classify the product/service to an industry (required). You can create a unique title for each product (required). You can write a description of the product (required). You can add an image that is 100 x 80 pixels in size (optional). You can add a bulleted list of features (optional). You can add a disclaimer (optional). You can add a URL to any location (optional). You can specify an employee to be the contact for service information (optional). You can create a promotion with a unique title, URL and description (optional). You can add a video about the product/service (optional). The formatting functionality in the product section will allow you to create custom presentations that are very pleasing to the eyes of your potential customers. You will not have any control over which recommenders (pictures) are displayed in each product description, though you can delete any recommendation you want. The Product Video Module is a front-end to any of your videos that are hosted within the YouTube platform. The presentation is fairly attractive; a video frame can be displayed from the video that provides some visual pop. You can add a custom title as a header, but it should not be the exact name of the video, as in the following example where the title is being displayed twice. The Promotions Module is a spartan three-slide, text-based widget that allows you to present offers with detailed information to potential customers. There is a one-slide option available for each of the product descriptions once a visitor has clicked through to the expanded page. LinkedIn has done an outstanding job of creating a flexible eco-system that allows a company to present a totally customized view of their products and services based on the demographic profile of a visitor. Facebook allows you to target advertisements demographically, but their platform does not give you the product flexibility that you see here. Further, the social media goals for any company using LinkedIn is narrowly focused – you need to generate recommendations and followers. Between your existing customers, and a well executed link-bait program, both are achievable. I think the requirement to generate new content on a scheduled basis is not as onerous as in the Facebook platform. In the long-run, it may be that Facebook and LinkedIn will complement each other, rather than be outright competitors. I see Facebook having more of a retail face, which is better suited for presenting products to individual consumers, while LinkedIn will have that B2B face, which is better for selling business solutions. To find out more about LinkedIn’s new platform, send me an email at Mark@MSprague.com or call me now at 781-862-3126. Very informative post. We’d like to make use of these features on our LinkedIn company page as well but we can’t seem to be able to find them. The Product Spotlight feature is one we’re most interested in. Is it only available to those with an upgraded account?